Is your kitchen HSE approved? Yes, Cove Cake Design is registered with the HSE according to European Communities (Hygiene of Foodstuffs) Regulations 2006. We have also completed the Primary Course in the Principles and Practises of Food Safety. As a one-woman business we have found that the needs of all of our clients are best met through email and phone consultations with tastings operated via our popular sample box service. Sample boxes are dispatched every 2-3 months and are subject to availability. Please enquire for next available dates. Our sample boxes consist of six cake flavours which are dispatched by overnight parcel service for you to sample in the comfort of your home. Flavours are chosen by Cove Cake Design although we will endeavor to accommodate any requests. Sample boxes are complimentary once deposit has been paid. Prior to payment of a deposit a fee of €40 for a sample box is charged which is redeemable against your deposit should you choose to order. Unfortunately all of our cakes presently contain wheat, eggs and dairy. Whilst all do not contain nuts we do use nuts in our kitchen. If you would like to have your cake decorated with fresh flowers we recommend that you order these from your florist for continuity. We will be delighted to liaise with you and your florist to decide on which flowers are most suitable and on their placement. We are happy to place pre-arranged flowers on your cake on delivery. Please note that it is important to ensure that flowers that are not suitable for consumption do not come into direct contact with the cake itself. We cannot be liable for any contamination to your wedding cake that may arise from the misuse of fresh flowers. We advise that you check your order carefully and let us know within 7 days whether changes are needed. Your cake is very important to us and should you require any alterations after that period we will endeavour to do our best to accommodate them. 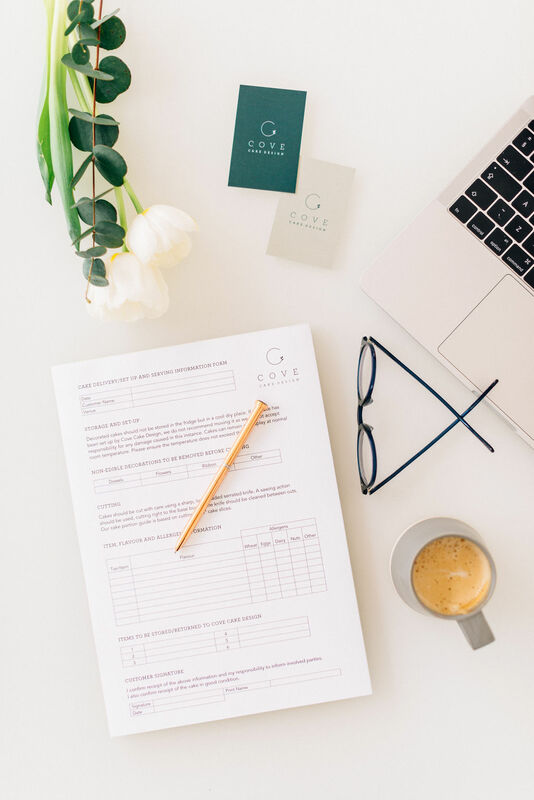 If the alteration affects the cost, or if the preparatory work on your cake has already commenced, Cove Cake Design reserves the right to increase the quoted fee accordingly. Do you have cake stands available for hire? We love to collect gorgeous cake stands and have a variety which are available for hire at a cost of €20-€35 depending on size, plus a €75-€150 refundable security deposit (depending on size of stand) per stand. Cake stands are due to be returned within three working days of your wedding date upon which the security deposit is repaid in the absence of any damage. How should my cake be stored? When your cake is collected/delivered, we will issue you/your event coordinator with a cake information sheet which will detail storage and serving information to ensure your delicious cake is served to your guests at its very best. To enjoy our cakes at their freshest, we recommend that they are consumed within 24 hours of delivery/collection. We offer a delivery and set-up service for wedding cakes. We are based in South County Dublin and delivery is calculated on distance to your venue and our set-up fee is €25. Celebration cake orders are collection only. We deliver anywhere within a two hour radius of South Dublin. Due to cost we do not offer delivery outside of this area. However you are welcome to collect your cake if your venue is further afield. If your cake is collected we will package it appropriately and issue you with storage and transportation guidelines. Cove Cake Design cannot accept responsibility for any damage to collected cakes after they have left our premises. For wedding cake orders cancelled within 6 weeks or celebration cake orders cancelled within 3 weeks of your scheduled date, the full balance is payable. Please note that all deposits are non-refundable. These are our most popular FAQs but our detailed Terms and Conditions policy will be emailed to you on placement of an order.